Whether it is for a butcher’s cold room, a large supermarket cold room or an industrial cold storage, Frigo l’Entrepôt can build your project with materials which offer the best energy efficiency. We only use urethane insulated panels, offering the best insulation. Most of our cold room constructions are custom built upon clients specifications following dimensions that are carefully calculated to ensure a perfect interlocking of the insulated panels. We hold 2 different types of insulated panels on inventory. We have “lock types” panels which are precut in our factory and assembled in your location. We also have standard interlocking panels which are cut and put together side by side and scealed to ensure a perfect fit. We install our refrigeration systems in our cold rooms and provide technical service. We use only insulation panels and the highest quality that exceeds energy standards. 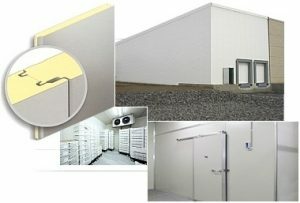 Several types of cold room doors are available at our location. Come choose yours. Available in single or double format pedestrian format trans-pallet. White finish or stainless steel with window. For further information on our cold rooms or to get a quote on your upcoming project, do not hesitate to contact us by email at info@lentrepotdufrigo.com or by phone 514-388-8181 during our regular business hours. 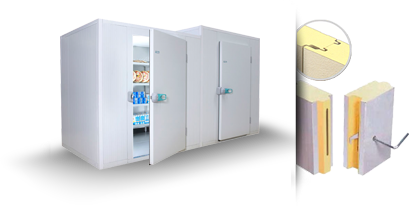 L’ENTREPÔT DU FRIGO HAS A VARIETY OF STANDARD SIZES COLD ROOMS WITH MECHANICAL REFRIGERATION SYSTEM INCLUDED, ALL READY FOR RENT.